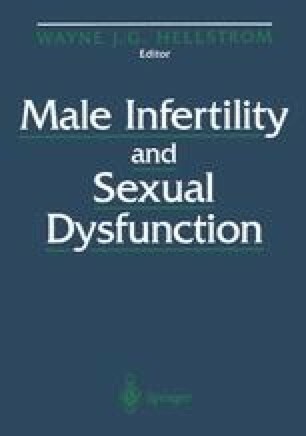 The differential diagnosis of male factor infertility can be subdivided into four major diagnostic categories: (1) irreversible germ cell failure, (2) hypogonadotropic hypogonadism, (3) anatomic defects, and (4) idiopathic infertility. Therapies for germ cell failure and hypogonadotropic hypogonadism are clearly delineated. Anatomic defects are surgically corrected. A specific therapy for idiopathic infertility has yet to be defined, but a number of medical therapies have been proposed for its treatment. Because of the heterogeneity of the disorders that fall into this category, specific etiologic factors for each are not yet defined, which prevents identification of specific therapies. No single empiric medical therapy proposed has proven efficacious when studied in a controlled, prospective fashion. Placebo-controlled trials are necessary because the treatment-independent pregnancy rate is 30% in 1 year.1 A 30% improvement in pregnancy rate in a noncontrolled study is therefore meaningless.